Today is the last warm day for a while according to the forecast, so I decided to pull a pair of shorts out of the drawer. I rarely wear shorts because as I’ve mentioned before it is incredibly hard to find ones that fit my body. The ones I wanted to wear today were from Ann Taylor Loft, but not the curvy fit, just regular fit. I had to do what I’ve described as “creative mending” to the waistband to get them to come in enough so they aren’t gaping a ton. As long as I wear a long enough top it’s okay because the poorly done stitching doesn’t show through. I’ve seen a lot of looks in magazines where the models will be wearing a blazer with shorts that I wanted to try to replicate. While it looks good, it never struck me as practical, because if it is cool enough to wear a blazer wouldn’t you be too cold to wear shorts? (Especially the tiny ones they show on models.) Nevertheless, I thought it was a cute look, so when I’m in a store with air conditioning I’ll throw on the blazer, but for most of the day I’ll just be wearing the white tee by itself. Yesterday I was in the mood to wear a little color. The sun was shining, it was warm outside and I felt like something bright. 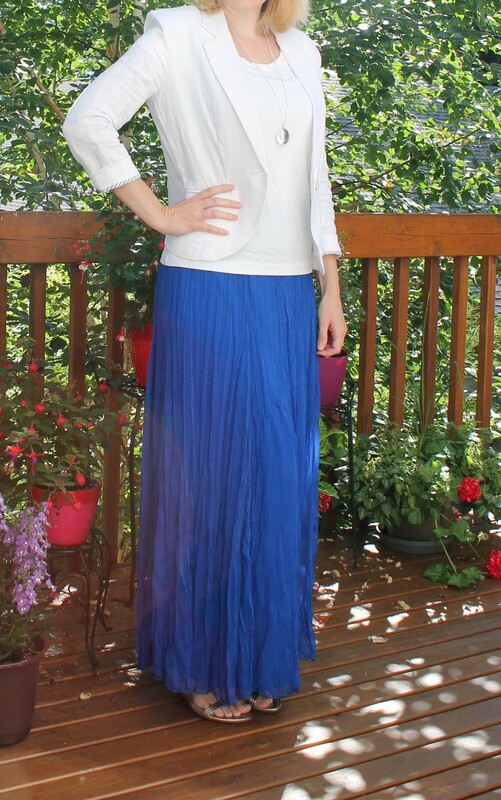 I decided to go with my new blue crinkle maxi skirt that I picked up at the Nordstrom Anniversary sale this weekend. I paired it with a white tee and a white linen blazer. 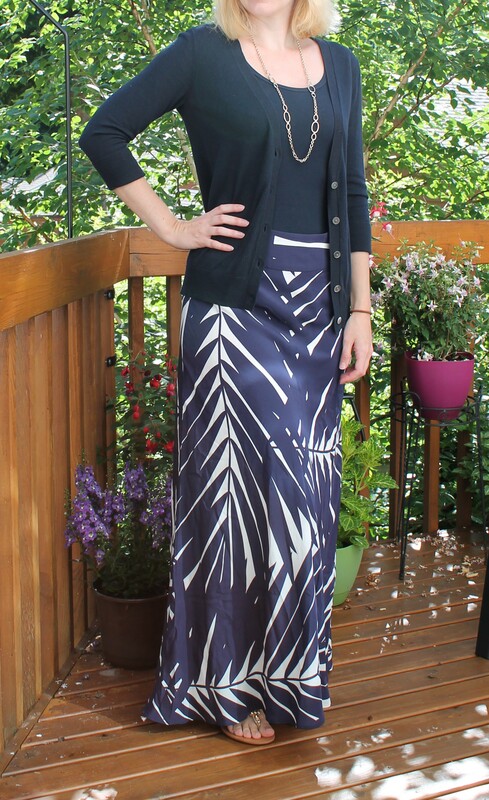 The skirt was so comfortable, and aside from rolling over it with my desk chair a few times, I loved wearing it. It has a nice stretchy knit foldover top so you can adjust how long it is. The knit lining was super soft, and the outer chiffon layer gave it a really nice look. Super happy I found this skirt. Today I hit the Nordstrom Anniversary sale and got a few pretty good items. The store was extremely crowded and felt a little “Bargain basement-y” but overall, there were some great pre-fall items I’m excited to wear. In order to feel stylish and ready for my shopping trip, I threw on these white capris, a red blouse from New York and Company, and my favorite Franco Sarto sandals. (Comfy shoes are a must for the mall.) I’m also wearing my new necklace from Tiffany & Co from the Gatsby collection. It was a present I got last night from my husband for our anniversary. 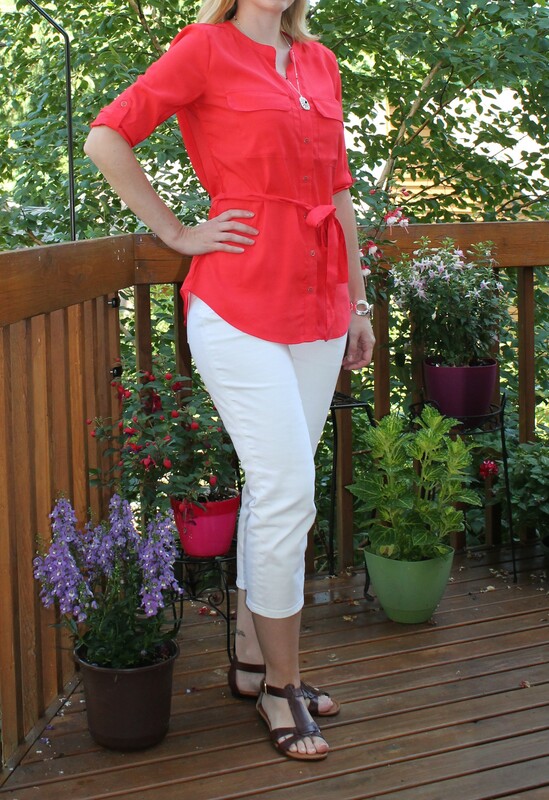 White jean capris, and a red blouse.